Merck and Co. are being sued over Zostavax, their vaccine which is marketed as the “shingles vaccine” and is the source of millions in marketing and advertising. Following several cases against Merck whereas individuals claim injury from taking Zostavax, there are said to be even more cases in the works. The plaintiffs have sued in Pennslyvania federal courts. “I think Merck has failed terribly … to warn about the very serious side effects and the failure of the vaccine to do what they claim it does,” attorney Marc Bern told FiercePharma. In a statement, Merck said it “stands behind the demonstrated safety and efficacy” of the shot, which is licensed in 50 countries. “Nothing is more important to Merck than the safety of our medicines and vaccines,” a spokesperson told FiercePharma. She said the company has distributed more than 36 million doses of the shot since its 2006 approval. Before winning a FDA nod, Zostavax’s safety and effectiveness were studied in more than 30,000 patients, and a CDC committee continues to recommend its use, she pointed out. “The company has continuously provided appropriate and timely information about Zostavax to consumers and to the medical, scientific and regulatory communities,” according to Merck’s statement. This story breaks just days following Dr. Sherri Tenpenny’s latest column, The Full Story About Zostavax, The Shingles Vaccine, whereas she breaks down the dangers and warnings related to the vaccine. Humans are the only known host for the herpes varicella-zoster virus (VZV) that causes chickenpox. A very benign infection in the vast majority of children, chickenpox used to be called a “right of passage” disease, with most kids contracting the infection between the ages of 8 and 12. Recovery left behind lifetime immunity and in little girls, antibodies to be passed to their infants through breast milk later on life. Vaccinated persons can still contract chickenpox. The so-called “breakthrough infection” occurs in approximately 2 percent of vaccinations per year. That may sound like a small number until you do the math. With nearly 4 million live births per year in the US, 2 percent equates to at least 80,000 cases of breakthrough chickenpox. And even though doctors say the infection will be “less serious” if the child has been vaccinated, severe cases have been reported. Without re-exposure, the dormant chickenpox virus can reactivate in adults, leading to the painful rash referred to as herpes zoster (HZ) or shingles. The zoster rash is typically unilateral, does not cross the midline and follows a distribution along a dermatome, an area of the skin supplied by nerves from a single spinal root. The painful rash usually lasts 7-10 days but can last 3 to 4 weeks, or more. HZ causes acute and chronic complications, with complications occurring in 15%–40% of cases. The most common is post-herpetic neuralgia (PHN), persistent, often permanent pain that remains long after the HZ rash has disappeared. Another severe complication HZ is herpes ophthalmicus (HO), when the virus inflames nerves near or in the eye. If not aggressively treated with antivirals and steroids, HO can result in loss of vision in the affected eye. "The Chickenpox Vaccine: A new epidemic of disease and corruption" is about behind-the-scene health issues and their effect on individuals in Antelope Valley, California-a geographically distinct region consisting primarily of two large cities, Palmdale and Lancaster, with a population of over 300,000. In 1995, the FDA licensed a vaccine to protect against a common childhood disease. Healthcare officials believed it was safe, when in fact, it had not been thoroughly tested. Dr. Goldman, who was studying the effect of the vaccine on the population, was encouraged to generate findings that would lead to publication in peer-reviewed scientific journals. All positive findings were published in a timely manner; however, when Dr. Goldman began to present deleterious outcomes, these seemed to be treated much differently and would portend increased risk of reactivation of a more serious disease harbored by 95% of the adult U.S. population. Meanwhile, some people are filing shingles vaccine lawsuits because they’ve developed a case of full-blown shingles AFTER getting the “vaccine.” Or they’ve dropped their 200-some bucks for the “vaccine,” and then they’ve gotten shingles, and suffered vision damage up to blindness, or postherpetic neuralgia, or other permanent nerve damage. Health Sciences Institute (HSI) authors published a January 2016 article which reported, in part, “UCLA researchers found that only one in 175 people who get the vaccine will be able to dodge a shingles flare-up.” Merck, meanwhile, claims Zostavax is 50% effective. Merck arrived at that tortured number this way: In the placebo group, 3.3 percent of the study participants developed shingles, compared to 1.6 percent in the vaccine group. Though that does represent a 50% difference; it also means the real, absolute risk reduction is a woeful 1.7 percent. Is that worth $200-some bucks, given the problems with this “vaccine”? Would you bet your eyesight on it? “It is simply no longer possible to believe much of the clinical research that is published, or to rely on the judgment of trusted physicians or authoritative medical guidelines. I take no pleasure in this conclusion, which I reached slowly and reluctantly over my two decades as an editor of The New England Journal of Medicine.” — Marcia Angell, MD, Drug Companies and Doctors: A story of Corruption. NY Review of Books, Jan. 15, 2009. The Shingles Vaccine: Help or Hype? Pharmacies are pushing very hard to promote the shingles vaccine in my local community at the moment. Signs are everywhere for adults 60 and older to get the “recommended” shingles vaccine and that they are available every single day! At $219 plus tax per jab, the shingles vaccine is certainly not cheap – that much is certain. Very interesting! Mass vaccination of children for chicken pox has apparently triggered a large increase in shingles in the adult population. So what has Merck done? It simply repackaged the chicken pox vaccine as Zostovax and made it approximately 14 times stronger. The National Vaccine Information Center reports that 89 deaths have been linked with the shingles vaccine. The Vaccine Adverse Events Reporting System (VAERS) has received reports on shingles containing vaccines since 1990. Shingles vaccine promoters will argue that the VAERS system reports adverse events that vaccinated people associate with the shingles vaccine, that those deaths may simply be apriori, or merely incidental to the vaccination. Some, perhaps. But all? And the 90 deaths associated or linked with the shingles vaccine in 15 years may be closer to 900, or even 9,000. This is well known, and here’s why. It is common knowledge – except for anyone working in mainstream media – that adverse events from vaccines are wildly under-reported. This well known weakness of VAERS skews all the numbers trotted out by vaccine profiteers and their legions of media and medical shills. Further, federal health officials have done little to increase vaccine provider reporting to VAERS since the 1986 passage of the National Childhood Vaccine Injury Act. This act vaccinates vaccine makers against liability with regard to vaccines forced on children, but it also requires that vaccine adverse events be reported. That first part is followed religiously by the courts, that second not so much. The National Vaccine Information Center (NVIC) reports that during the meeting of the National Vaccine Advisory, CDC officials reported that only between one to 10 percent of vaccine adverse events are reported to VAERS. Therefore, the VAERS system that receives some 30,0000 adverse event reports annually should be receiving a minimum of 300,000 adverse event reports (if actual events were really reported), or as many as 3 million adverse events related to vaccines. It’s easy to skew numbers, and nobody skews them better than vaccine profiteers. The CDC, sadly, is now proposing that all VAERS reports be submitted online. No more paper forms will be allowed. Much like the new American voting system – a sham if ever there was one (read Mark Crispin Miller and BlackBoxVoting.org) – the paperless trail will be much easier to disappear. Doctors and nurses and others will no longer be able to scribble an adverse vaccine event on paper when they have a moment. They will be forced to go to a computer and jump through all the attendant hoops. This paperless idea from CDC virtually guarantees we will see fewer adverse event reports (all in the name of “Progress,” of course). NVIC therefore opposes the CDC’s proposal to eliminate the option of submitting handwritten reports. CDC officials apparently live in a different world than the one you and I inhabit. NVIC says what’s also missing from the CDC’s proposed new VAERS form is information about vaccine reactions in siblings. Why is the CDC always erring on the side that favors Big Pharma and other corporate entities, and why is mainstream media always doing the same thing? Follow the money. Why did Wall Street Journal bury Merck Fraud Story? Under reporting. Because the reports are submitted voluntarily, many patients and doctors do not report vaccine reactions. Different estimates exist for the amount of underreporting and range from a factor of 10 to as much as a factor of 100 (meaning that the true number of vaccine reactions is between 10 and 100 times higher than what is reported to VAERS). The shinglesZostovax vaccine Merck Pharmaceuticals has been marketing since 2006 now comes with a warning that it could cause eye damage. February 17, 2016, the FDA approved a label change to Merck’s Zostamax vaccine prescribing information. The change to the label added “Eye Disorders: necrotizing retinitis.” Merck consequently faces Shingles Vaccine Lawsuits over this dubious vaccine. Keratitis causes inflammation and scarring of the eye tissue. If one fails to get treated fast, it can lead to permanent vision loss. Health Sciences Institute (HSI) points out in a Jan 21, 2016 piece that the researchers say they don’t know why the shingles shot may cause keratitis, but we do know that keratitis has been linked to autoimmune disorders, and that shots like the shingles vaccine can profoundly short circuit the immune system. The mainstream media didn’t miss a beat, of course, telling us that despite these little “side effects” (hardly worth a mention, really), it’s still a good idea to get the shingles vaccine, and never mind the fact that it barely works at all, or perhaps causes more cases of shingles than it prevents. Two important FDA approved changes to the warning label of Merck Pharmaceutical’s shingles vaccine, Zostavax, have been made since the controversial drug was introduced in 2006. The first was in August 2014, when, in addition to potentially causing chickenpox, another side effect was added: shingles! That’s right. The vaccine that had been – and continues to be -- aggressively marketed to prevent seniors from contracting this excruciating condition was found to actually cause shingles in some individuals. This disorder, as well as keratitis, causes inflammation and scarring of the eye tissue and can lead to permanent vision loss if not treated quickly. It was reported by WebMD 20 individuals (children and adults) developed keratitis within a month of receiving a chickenpox or shingles vaccine. Keratitis symptoms for adults developed within 24 days of vaccination, while symptoms in children began within 14 days of vaccination. information on FDA Form 356h. In light of the discovery of Autoimmune Syndrome Induced by Adjuvants, or ASIA, Vaccines and Autoimmunity explores the role of adjuvants – specifically aluminum in different vaccines – and how they can induce diverse autoimmune clinical manifestations in genetically prone individuals. Vaccines and Autoimmunity is divided into three sections; the first contextualizes the role of adjuvants in the framework of autoimmunity, covering the mechanism of action of adjuvants, experimental models of adjuvant induced autoimmune diseases, infections as adjuvants, the Gulf War Syndrome, sick-building syndrome (SBS), safe vaccines, toll-like receptors, TLRS in vaccines, pesticides as adjuvants, oil as adjuvant, mercury, aluminum and autoimmunity. The following section reviews literature on vaccines that have induced autoimmune conditions such as MMR and HBV, among others. The final section covers diseases in which vaccines were known to be the solicitor – for instance, systemic lupus erythematosus – and whether it can be induced by vaccines for MMR, HBV, HCV, and others. Edited by leaders in the field, Vaccines and Autoimmunity is an invaluable resource for advanced students and researchers working in pathogenic and epidemiological studies. We have approved your request (to) update the Package Insert, Section 6.3 Postmarketing Experience to include “infections and infestations: Herpes zoster (vaccine strain)” and to update the Patient Package Insert to include “Shingles” in the “What are the possible side effects of ZOSTAVAX?” section. See also – Shingles Vaccine: Help or Hype? It seems reasonable to evaluate the vaccine’s maker to see if its advertising the effectiveness of its vaccines is believable. It’s helpful to keep in mind that Merck also produced the ill-fated Gardisil vaccine nightmare. A Merck whistleblower recently explained that the company faked measles vaccine data in order to retain lucrative government contracts. See it here: Merck Whistleblower. Merck also produced Vioxx, the four-dollar aspirin that caused thousands of people heart attacks and strokes. The company settled thousands of lawsuits for a collective several billion dollars after Vioxx killed an estimated 500,000 Americans. Merck founder George Merck appeared in TIME magazine (the great disinformation rag which helped sell the “lone-nut” theory in the murder of JFK) in 1956. Merck surprisingly told some truth to TIME at the time. He explained that you don’t sell the drug; you sell the disease. Merck sells its shingles vaccine in this same old fashioned way, by selling the disease. It uses the oldest trick in the book, the Hegelian dialectic: problem/reaction/solution. Show somebody the problem, then sell them the solution. Since all vaccines are sold with the fear – it’s all about fear – all a company needs do is show the horrors of a potential “outbreak” and then swoop in with the solution. To sell the shingles vaccine, Merck displays shingles problems on its web site. You can watch a vaccine promo video there of how horrible shingles is. Then you get the non sequitur solution clearly implied: Because shingles is really bad, you need the shingles vaccine to stop it from getting you. The glaring problem is that when you look closely, there’s no guarantee the shingles vaccine works, certainly no guarantee that it will work for you. Is it worth the risks? The fine print will tell you it appears to lower the risk of contracting shingles for some 50 percent of at least one study’s participants, but look closer and the chance it will work at all is much lower than that. Look closer yet and you can begin to see “side effects,” the great euphemism for things that really do happen, that have happened, and that will happen again to some. Pharmacies and television spots are pushing hard to promote the shingles vaccine. Signs tell adults 60 and older to get the “recommended” shingles vaccine. Shingles does represent a threat to seniors. • One live virus shingles vaccine was licensed in the U.S. in 2006 for adults over 50 years, Zostavax, made by Merck. • The CDC recommends people 60 and older take one jab of the shingles vaccine. • Shingles vaccine reported complications include local swelling, pain and redness at injection site, zoster-like skin rash, headache, joint pain, muscle pain, fever, abnormally swollen glands, hypersensitivity reactions including anaphylaxis (shock). • Effectiveness of the shingles vaccine is reported to be about 51 percent. (emphasis ours) The Merck shingles vaccine contains live attenuated varicella zoster virus. Vaccine strain virus transmissions from shingles-vaccinated people to others has been reported. Did you get all that? Mass vaccination of children for chicken pox reportedly triggered a large increase in shingles for adults. Merck’s response was to repackage the chicken pox vaccine as Zostovax and make it some 14 times stronger. The shingles vaccine is essentially the chicken pox vaccine 14X stronger. Yet it STILL only boasts an effectiveness rate of 51 percent. When you look closer, that figure is also misleading. • Women who are pregnant or who might become pregnant within 3 months. • Persons who are immunosuppressed or immune deficient, such as those with a history of leukemia, lymphoma or other • disorders affecting the bone marrow or lymphatic system, AIDS or those on immunosuppressive therapy. • Those individuals who are experiencing an acute illness or fever. In addition, people who have experienced a previous severe allergic reaction to gelatin or the antibiotic neomycin should not get the shingles vaccine. The shingles vaccine contains MSG and aborted fetal cell tissue, MRC-5 cells, “developed in September 1966 from lung tissue taken from a 14 week fetus aborted for psychiatric reason from a 27 year old physically healthy woman.” Pro Life advocates might care to pay attention. Is it morally ok to protest against abortion and then use the rancid results for yourself? Does the shingles vaccine Work? Postherpetic neuralgia from shingles can be debilitating for seniors. Even if the shingles vaccine didn’t help reduce infections at all but significantly reduced postherpetic neuralgia, that would be potentially wonderful. However, the marketing, as usual, clashes with the reality. According to Dr. David Brownstein, the reduction in postherpetic neuralgia from the shingles vaccine is so small as to be nearly insignificant. Really? A tiny .26% decline in the risk of postherpetic neuralgia for those who receive the shingles vaccine? At upwards of $200, the shingles vaccine isn’t cheap. Neither is advertising, but somebody has to pay for that advertising. Will it be you? The recent controversy over the documentary "Vaxxed: From Cover-Up to Catastrophe," despite being attacked by so many who haven’t seen it, is bringing public attention to real life episodes of vaccine damaged children and the U.S. Centers for Disease Control (CDC) whistleblower Dr. William Thompson’s attempt to reveal fraud in the CDC. But this accurate CDC episode reveals only one episode of hiding data to deal disinformation publicly that doesn’t support vaccine safety. There have been several other vaccine report cover-ups and other types of fraudulent activity in addition to the Dr. Thompson whistleblower episode. They all support the need to dismantle the bloated budgetary expanse of CDC headquarters and activities. The CDC’s financial waste was investigated in great detail by Senator Tom Coburn in 2007, unfortunately nothing substantial came of his work. The CDC keeps demanding and getting more funding. We’ll start from the most recent discovery of lies and cover-ups and work back chronologically to earlier episodes of CDC outright blatant deception and fraud that serve to protect various industries instead of the people that are harmed by pharmaceutical interventions, especially vaccines. The group, which claimed to represent scientists across the CDC's diverse branches, calls itself SPIDER (Scientists Preserving Integrity, Diligence and Ethics in Research). The letter to CDC Chief of Staff, Carmen Villar, expressed alarm "about the current state of ethics at our agency." The scientists complained that "our mission is being influenced and shaped by outside parties and rogue interests" and "circumvented by some of our leaders." The scientists told Villar that, "questionable and unethical practices, occurring at all levels and in all of our respective units, threaten to undermine our credibility and reputation as a trusted leader in public health." The letter charged that staff level scientists "are intimidated and pressed to do things they know are not right," and that, "Senior management officials at CDC are clearly aware and even condone these behaviors." Now lets move on to the next section in regard to the varicella vaccine itself. The shingles vaccine is just another version of the varicella vaccine itself. Ineffective Chicken Pox ShotThe main study to review was published in the medical journal Vaccine in 2013, and was a statistical analysis of data gathered since the introduction of the chicken pox vaccine in 1995 (4). The chicken pox vaccine was NOT as effective as natural immunity. The chicken pox vaccine was NOT proven to be cost-effective. The chicken pox vaccine FAILED to provide long-term protection. Not only did the report show that vaccine effectiveness had declined well below 80% by 2002, but researchers pointed out that cases of shingles increased during this time and that CDC authorities claimed that no such increase had occurred. They also conveniently ignored the natural boost in immunity the general public enjoyed before mass vaccination. Some scientists are convinced that the sharp rise in shingles cases recently (a 90% increase between 1998 and 2003) is directly linked to our lack of natural immunity against chicken pox. Basically, since we’re no longer exposing ourselves to the chicken pox virus, we aren’t developing innate resistance against shingles. The CDC itself reported in the New England Journal of Medicine that the chicken pox vaccine was a failure when it came to long-term immunity and began recommending a second dose (booster) shortly after the first (6) – a second dose of the same vaccine that didn’t work. In actuality, the CDC admits that people don’t really die from chicken pox, but rather from “complications” of chicken pox in immunocompromised children and the elderly. And let’s not discount deaths that might occur as a result of medical treatments themselves such as aspirin and antipyretics (fever reducers). ♦ Between March 1995 and July 1998, the federal Vaccine Adverse Events Reporting System (VAERS) received 6,574 reports of health problems after chickenpox vaccination (7). That’s one adverse health event for every 1,481 chicken pox vaccinations, 14 of which resulted in death. ♦ As a result of these vaccine reactions, 17 warnings were added to the manufacturer’s product label AFTER the vaccine was being used (8). It’s worth mentioning that adverse vaccine events are greatly under-reported (by as much as 90 percent, according to some experts) making the dangers of the chicken pox vaccine possibly far worse than these statistics imply. Despite these scientific findings, the chicken pox vaccine continues to be recommended and administered to millions, a fact which suggests that public health has taken a back seat to profit. Vaccine. 2013 Mar 25;31(13):1680-94. doi: 10.1016/j.vaccine.2012.05.050. Epub 2012 Jun 1. In the prelicensure era, 95% of adults experienced natural chickenpox (usually as children)-these cases were usually benign and resulted in long-term immunity. Varicella vaccination is less effective than the natural immunity that existed in prevaccine communities. Universal varicella vaccination has not proven to be cost-effective as increased HZ morbidity has disproportionately offset cost savings associated with reductions in varicella disease. Universal varicella vaccination has failed to provide long-term protection from VZV disease. Over four years ago it was obvious to my eye that autism disorder rates changed dramatically in certain specific years. Looking at autism disorder prevalence data from the US Dept of Education it was clear that there were three specific years in which autism prevalence rose dramatically, and Sound Choice Pharmaceutical Institute (SCPI) went on to perform the statistical analysis to show that 1980, 1988 and 1996 were ‘changepoint’ years for autism disorder. In 2010 the EPA published data confirming the 1988 changepoint as a worldwide autism disorder changepoint. 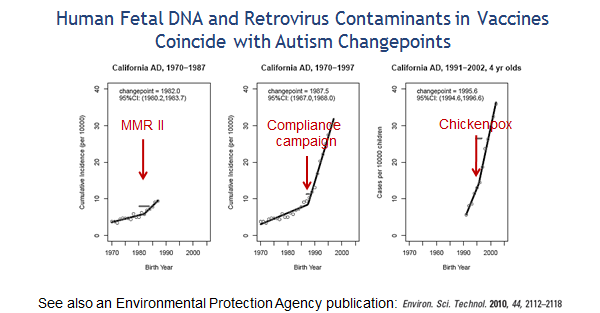 As the EPA scientists point out in their publication, identification of ‘changepoints’ such as these tell us that some environmental factor was introduced that triggered such a sudden and dramatic rise in autism. Pasted below are the 3 changepoints Sound Choice identified for autism disorder prevalence in the US. What environmental factor is associated with these three changepoints? The only childhood universal factor that is associated with all three changepoints is the introduction of vaccines contaminated with aborted fetal DNA and retroviral fragments. In 1979 the first aborted fetal vaccine was introduced to the US (MMRII), in 1989 a second dose of this vaccine was added and compliance doubled, and in 1995 another aborted fetal vaccine was introduced to the US (Varicella – chickenpox). Source: Independent Computer Scientist, P.O. Box 847, Pearblossom, CA 93553, United States. In a cooperative agreement starting January 1995, prior to the FDA's licensure of the varicella vaccine on March 17, the Centers for Disease Control and Prevention (CDC) funded the Los Angeles Department of Health Services' Antelope Valley Varicella Active Surveillance Project (AV-VASP). Since only varicella case reports were gathered, baseline incidence data for herpes zoster (HZ) or shingles was lacking. Varicella case reports decreased 72%, from 2834 in 1995 to 836 in 2000 at which time approximately 50% of children under 10years of age had been vaccinated. Starting in 2000, HZ surveillance was added to the project. By 2002, notable increases in HZ incidence rates were reported among both children and adults with a prior history of natural varicella. However, CDC authorities still claimed that no increase in HZ had occurred in any US surveillance site. The basic assumptions inherent to the varicella cost-benefit analysis ignored the significance of exogenous boosting caused by those shedding wild-type VZV. Also ignored was the morbidity associated with even rare serious events following varicella vaccination as well as the morbidity from increasing cases of HZ among adults. Vaccine efficacy declined below 80% in 2001. By 2006, because 20% of vaccinees were experiencing breakthrough varicella and vaccine-induced protection was waning, the CDC recommended a booster dose for children and, in 2007, a shingles vaccination was approved for adults aged 60years and older. In the prelicensure era, 95% of adults experienced natural chickenpox (usually as children)-these cases were usually benign and resulted in long-term immunity. Varicella vaccination is less effective than the natural immunity that existed in prevaccine communities. Universal varicella vaccination has not proven to be cost-effective as increased HZ morbidity has disproportionately offset cost savings associated with reductions in varicella disease. Universal varicella vaccination has failed to provide long-term protection from VZV disease. Do you actually think that the rationalization for a varicella, (chicken pox vaccine, and as well the now so called shingles vaccine, which is the same thing, only with more antigen in it), was NOT that rationale motivated by profits? The potential intervention to provide a booster varicella (or shingles) vaccination to adults aged 60 years and older (Oxman 1995) will fail to ameliorate the greatest potential for increased burden of HZ disease among adults aged <50 (parents) who, in the prelicensure era received considerably more exogenous exposures (boosts) than the elderly (Fuller-Thomson and Minler 2001). No cost-benefit analysis performed to date has justified a $10 billion expense to provide a “booster” varicella vaccination to each of the 200 million adults in the United States (using $50 per dose). Likely such booster vaccination would require repeating after an interval that is currently unknown. Additional studies conducted in different communities with high vaccination rates will help elucidate the duration of immunity afforded by varicella vaccination and the roles of both mechanisms of immunologic boosting: periodic exogenous exposures and asymptomatic endogenous reactivations. The United States is the first to implement a universal varicella vaccination program where, in time, naturally occurring varicella and its booster effect will be nearly eradicated. It will be difficult to design booster interventions that are cost-effective and meet or exceed the level of protection provided by immunologic boosting that existed naturally in the community in the prelicensure era (Goldman 2005). Int J Toxicol. 2006 Sep-Oct;25(5):313-7. The case against universal varicella vaccination. Source: Medical Veritas International Inc., Pearblossom, California 93553, USA. In 1995, the United States became the first country to implement a Universal Varicella Vaccination Program. Several questions remain: Is the varicella (chickenpox) vaccine needed? Is it cost effective as a routine immunization for all susceptible children? Or is it more beneficial for the disease to remain endemic so that adults may receive periodic exogenous exposures (boosts) that help suppress the reactivation of herpes zoster (shingles). In addition, as vaccination coverage becomes widespread, does loss of immunologic boosting cause a decline in vaccine efficacy and result in a reduced period of immunity? Scientific literature regarding safety of the varicella vaccine and its associated cost-benefit analysis have often reported optimistic evaluations based on ideal assumptions. Deleterious outcomes and their associated costs must be included when making a circumspect assessment of the Universal Varicella Vaccination Program. Why a Shingles Epidemic is Bolting Straight at the U.S. Herpes zoster after varicella-zoster vaccination. Fahlbusch M, Wesselmann U, Lehmann P.
Shingles is a disease caused by the virus that causes chickenpox. Once a person has had chickenpox, the virus stays in their body in a dormant state. Later in life when the immune system is weakened, the virus can resurface and cause shingles. Shingles is not something you can catch from somebody else with the disease. However, you can get chickenpox from someone with shingles, which in turn could develop into shingles later. Shingles is characterized by a skin rash that is extremely painful. Shingles first manifests itself by a pain that tingles or burns at a single site on one side of the body. The rash appears after a few days and may even blister. The rash can last for up to thirty days. Shingles is mainly a disease of the elderly, but younger persons can get it. One out of every five people who get shingles end up with nerve pain that can last months and even years. The vaccine for shingles is called Zostavax. As with most vaccines, it contains a weakened form of the virus, which in this case is the chickenpox virus, also known as Varicella zoster. It is suggested that people that are 60 years old and older get the shot because as people age, they have worse reactions to shingles. The elderly should get the vaccination even if they never remember having had chickenpox. People who have had shingles should still get the vaccine so they don’t get it again. They just need to wait until after the shingles rash is gone before they receive the vaccine. Getting the vaccine can decrease the risk of contracting shingles by 50%. There are some people who should never get the Zostavax vaccine. This includes people who have severe allergic reactions to gelatin, taking steroids, and those who have a weakened immune system. It should not be given to pregnant women or those who plan on becoming pregnant. This vaccine does not prevent chickenpox. The Zostavax vaccine is essentially the same vaccine as that used for chickenpox, except significantly stronger. Zostavax contains live varicella zoster virus. The virulence of the virus is reduced or “attenuated”. Attenuated vaccines are designed to activate the immune system with the decreased risk of actually developing the disease. Zostavax is developed from a live attenuated version of the Oka/Merck VZV vaccine strain. A risk of using a live virus vaccine is that it is not weakened enough or “under -attenuated”. Under-attenuated live virus creates an increased risk of developing the disease the vaccine was to prevent. Once injected, attenuated live virus has been shown to recombine into more virulent strains causing disease. What Can Reactivated Varicella Zoster Virus Cause Besides Shingles? •Encephalitis, an acute inflammation of the brain. •Focal neurological abnormalities can also occur, including ataxia (trouble walking), hypertonia (increased muscle tone) or hypotonia (decreased muscle tone), and hemiparesis (weakness on one-side of the body). •Acute disseminated encephalomyelitis (ADEM) is an immune-mediated inflammatory encephalopathy. Got that? Get more doses of this useless vaccine as soon as possible because it doesn’t work. How about adverse reactions? According to the Merck Varivax (varicella vaccine) package insert 4% in the original clinical trial developed a ‘Varicella – like rash (generalized)’ In other words, 4% got chickenpox. And in post marketing use (real world) these adverse events have been reported ‘Encephalitis; cerebrovascular accident; transverse myelitis; Guillain-Barré syndrome; Bell’s palsy; ataxia; non-febrile seizures; aseptic meningitis.’ These are severe neurological reactions that can cause lifetime disability and/or death. And lest you forget, Merck’s Varivax is a certified blockbuster pharmaceutical product, with 2012 global sales of $1.34 billion! More doses equals more profits! Background: Two-dose varicella vaccination is recommended for optimal control of varicella in populations with high (>90%) one-dose coverage. Optimal timing of the second dose may depend on whether breakthrough varicella results from primary vaccine failure (no protective immunity after vaccination) or secondary vaccine failure (waning protective immunity). Methods: Published literature (1995-2012) on vaccine failure following varicella vaccination cited in PubMed and other online sources was reviewed. Results: Nineteen publications detailed 21 varicella outbreaks with breakthrough varicella rates ranging from 0% to 42%; the publications showed no consistent trend between breakthrough varicella rate and time since vaccination. Conclusions: Literature to-date indicates a relatively high rate of primary vaccine failure and limited evidence of secondary vaccine failure amongst one-dose varicella vaccine recipients, suggesting that a short interval between two doses might be preferable in countries considering implementation of universal varicella vaccination to reduce breakthrough varicella. However, any potential disruption to well-established vaccination schedules should be considered. I don't find that to be very affirmative of and impressive in regard to that vaccines actual, efficacy. To cover-up the wild increase for the disease, public health officials are blaming one unvaccinated child as the cause despite 97 percent of vaccinated children contracting chicken pox. More than 85 percent of those vaccinated received FULL VACCINATIONS. Placed another call to the Indiana State Department of Health. Was able to reach the epidemiologist working the chicken pox outbreak. There are a total of 92 cases so far. Only 3 were never vaccinated. 10 had received one vaccine and 79 were fully vaccinated. They are seeing fewer lesions in the fully vaccinated. Zero deaths. Possibly one hospitalization but not sure off the top of their head. Zero complications from chicken pox. We were told that only one chicken pox vaccine was supposed to provide lifelong immunity but this did not turn out to be the case. A booster was added and yet we are seeing a very high rate of fully vaccinated children contracting chicken pox. We asked if another booster will be mandated and told possibly. We asked about vaccine failures and were told this is not vaccine failure because the severity of lesions in the fully vaccinated was less than if never vaccinated and that no vaccine is 100% effective. We were told that if vaccines save one life they are worth it. We asked how many children died from chicken pox before the vaccine. This epidemiologist was unsure. TERRE HAUTE, Ind. – The chief medical officer of the Indiana State Department of Health says western Indiana's Vigo County is experiencing the largest known current outbreak of chickenpox in the U.S.
Dr. Joan Duwve (DUH'-vee) told the Terre Haute Tribune-Star for a story this week that Vigo County usually has fewer than 10 cases per year but had had 84 since September. The Vigo County health Department has scaled back the number of cases after reporting more than 100 cases earlier in the week. As for the above Huffington Post article, it as well stating this. Duwve also told the Star-Tribune that the chickenpox outbreak started with a child who was un-vaccinated, but that even children who receive chickenpox vaccinations might be at risk since the vaccination only works 90 percent of the time. It can also occur in a less-severe form in children who have been properly vaccinated, Duwve noted. My note: In every case they attempt to falsely blame the un-vaccinated, and regardless of how obvious the evidence of existing vaccine failure, actually is. They can not actually show or prove the source of the original ground zero person so called causing the outbreak. They never determined of provided evidence for that at Disney Land, either; but still the un-vacinated were again blamed. See now how they spin it ALL??? NEVER admit to failure of ANY vaccine, nor any harm; not even as to Gardasil. Pertussis vaccine, covering up the failure, and the same spin only worse! More doses and more boosters needed. Take a look as well at all the similar outbreaks in the vaccinated and in regard to the pertussis and measles vaccines, which listed on this site page, right here. Most studies of varicella vaccine effectiveness have been conducted during outbreak investigations. These investigations all used a retrospective cohort study design with clinically diagnosed disease as the outcome. Details on illness were obtained retrospectively from parents and health care providers, with some information (and case reports) obtained prospectively if the outbreak was ongoing. In recent years, standard practice during outbreaks has been to confirm some varicella cases through laboratory testing [8, 21, 23, 24]. Thirteen investigations of outbreaks provided 16 separate estimates of vaccine effectiveness for the prevention of all varicella that ranged from 44%–100% (mean, 79.9%; median, 84.5%), with higher estimates for the prevention of combined moderate and severe varicella (mean, 95.6%; median, 96.5%) and severe varicella only (100%) [8–10, 13–16, 18, 21–24]. During the early years of the varicella vaccination program, outbreaks were reported to occur predominantly in child care centers [13, 17, 18]. In more-recent years, outbreaks have been reported to occur almost exclusively in elementary schools, some of which have extremely high vaccine coverage (96%–98%) [10, 19, 21, 25]. Wow, really impressive huh? Look at the references; and it all looks as quackery crazy as a cat chasing its tail. When even the CDC admits to outbreaks in the vaccinated; and then down plays it claiming, oh well; it should lessen the severity of the case if the child gets two doses. See Control & Investigation of Outbreaks for guidance in monitoring, investigating and controlling varicella outbreaks. Data on the number of chickenpox (varicella) outbreaks that occur each year in the United States are limited. But, since the chickenpox vaccine was introduced, the number of outbreaks has gone down. Chickenpox outbreaks continue to occur even in settings such as schools where most children are vaccinated with one dose. However, there have been fewer outbreaks reported ever since the two-dose chickenpox vaccination program started in the United States. Also, these outbreaks have been smaller. The vaccine may not prevent all chickenpox, but it is very effective at preventing severe cases. Conclusions. A chickenpox outbreak occurred in a school in which 97% of students without a prior history of chickenpox were vaccinated. Students vaccinated >5 years before the outbreak were at risk for breakthrough disease. Booster vaccination may deserve additional consideration. Varicella Outbreaks After Vaccine Licensure: Should They Make You Chicken? Vaccinated children with varicella had milder disease than unvaccinated. In conclusion, we found varicella outbreaks in CCCs with both high and low vaccination coverage. Vaccine effectiveness was within the range predicted by the literature. Vaccination led to a lower attack rate in the highly vaccinated CCC and appeared to protect from severe disease. But yet in the mainstream literature they are still attempting to claim the varicella vaccine, is 90% effective; so WHICH is it? The question is, in an illness that is generally mild and recovered from without complications in a few days; would you want to trade a less severe case of varicella, for the toxicity and contaminant potential of the vaccine? And what effect does the vaccine have on developing that life time immunity acquired with natural infection? They don't tell you, do they? What is the answer? So, they are trading increased chances of and cases of shingles, and the added need of a shingles vaccine, for THIS? They are trading for THIS, knowing there will be need of life time varicella boosters. Shingles vaccine is only a stronger antigen form of the varicella vaccine, as you will recall. And the woman who becomes pregnant at lets say for example age 21-26; are they going to test for believed protective, antibody titers? Eventually, will they vaccinate during pregnancy? And actually, how can they claim there is no pharma for profit madness going on here? Lets take a LOOK at what is actually in the varicella vaccine! THAT is a lot of chemical and biologically altered CRAP, to be injecting in your child! Ingredients: Gelatin, Monosodium Glutamate (MSG), Human Diploid cells: MRC5 proteins, Neomycin, Sucrose, Sodium chloride, Sodium phosphate-monobasic, Sodium phosphate-dibasic dodecahydrate, Bovine (cow) serum, Potassium phosphate, Human diploid cells (WI-38), Ethylenediaminetetraacetic acid (EDTA), Potassium chloride, Glutamate. Should it be important to know, THIS? Why is the CDC not telling anyone nor putting any of that forth? Instead they again paint only a rose garden picture with more fear mongering, about the getting vaccinated for varicella, benefits. Ask, why was there no seen need for a shingles vaccine prior to the varicella vaccine; trading one short term low risk illness for a potentially long term, other; and more repeat toxic and potentially ineffective vaccinations. More harm than good. Typical. But there’s an even darker side to this picture: shingles. Shingles is a far more serious condition. At a minimum, it causes a rash along the path that a nerve root serves, along with severe pain that lasts for around a month. Mercola reports that it can also lead to “bacterial skin infections, Hutchinson’s sign, Ramsay Hunt Syndrome, motor neuropathy, meningitis, hearing loss, blindness, and bladder impairment”. Now shingles is increasing. Worse, we’re seeing children get it. Though it’s still rare in them, the fact is that children virtually never suffered from shingles until the chicken pox vaccine was implemented. But why would shingles be increasing, with even children succumbing, when there’s a chicken pox vaccine? It turns out, as documented by the statistical analysis of Gary S. Goldman, that exposure to children with chicken pox boosts one’s immunity to shingles.The mechanism isn’t known, but the protection is real. The UK’s Public Health Laboratory Service has found that adults who live with children and are exposed to chicken pox as a result receive protection against shingles. In other words, exposure to active cases of chicken pox results in a boost to the immune system’s ability to prevent shingles attacks. Now that children are getting chicken pox less often, the adults in their lives are unlikely to come into contact with active chicken pox. The result is more and more shingles, with all the pain and adverse effects entailed. Chicken pox and shingles vaccines carry serious risks. As Dr. Mercola points out, between March 1995 and July 1998, the Vaccine Adverse Events Reporting System (VAERS) reported 6.574 adverse events associated with chicken pox. That’s about 1 adverse event for every 1.481 vaccinations. About 4% of those reports resulted in severe adverse effects, including ”shock, encephalitis (brain inflammation), and thrombocytopenia (a blood disorder)”. 14 deaths were reported. In all likelihood, at most only 10% of all adverse reactions to vaccines are reported to VAERS. That brings the total number of deaths from the vaccine to a more probable 140 in a little over four years, which approaches the number of child deaths attributed to chicken pox prior to vaccination. When you also factor in the fact that many vaccinated children and adults still get chicken pox, it becomes apparent that the vaccine is providing little or no benefit. It may even be resulting in more deaths, not fewer. THIS is the in denial and misguided information that typically the medical side is stating. Here again they do not leave you any accurate comprehension of what really goes on; intentionally avoiding the real questions. But yet they realized that shortly after use of the varicella vaccine, that there was an increase in cases of shingles, and thus produced the shingles vaccine. Again pahrma is trading one illness for another, and then countering both with a toxic solution that requires repeated vaccine boosters for life..
What Does the Shingles Vaccine Do? The shingles vaccine, Zostavax, contains a weakened chickenpox virus (varicella-zoster virus). The shingles vaccine helps stimulate your immune system to battle disease caused by the varicella-zoster virus, reducing the risk of getting shingles in people aged 50 and older. In scientific studies, the shingles vaccine reduces the risk of developing shingles by about 50%. Findings show that the shingles vaccine also helps people who go on to develop shingles have shorter periods of nerve pain called postherpetic neuralgia (PHN), which is extremely painful and can last anywhere from 30 days to months or even years after the rash has resolved. The nerve pain associated with shingles can be so severe in some people that it disrupts their lives. The shingles vaccine helps prevent shingles in the person receiving the immunization. But because shingles is a contagious viral infection, the shingles vaccine also works to stop the spread of the virus just like childhood immunizations for varicella or measles, mumps, and rubella. If a person with shingles passes the virus to someone who has never had chickenpox, the newly infected person will develop chickenpox, not shingles. So, what they are doing is circumventing the natual cycle of varicella as it once was, by giving does of varicella antigen through injection, instead of it being acquired by the naturally acquired route that normally would have been exisiting, if children were not now vaccinated for varicella. What is the difference between the Chicken Pox vaccine and the Shingles vaccine? So, there we see that both vaccines are made from the same virus seed stock, only the shingles vaccine contains more virus antigen and is only for people 60 yrs and older. The second dose may be given at an earlier age if it is given at least 3 months after the first dose. People 13 years of age and older who have never had chickenpox or received chickenpox vaccine should get two doses, at least 28 days apart. To check if you are protected from chickenpox, see Immunity (Protection) Against Chickenpox. For more information on vaccination of people with weakened immune systems, see Vaccination Recommendations for Specific Populations. WOW, that nearly includes the WHOLE for profit POPULATION ...and its not only about BIG profits??? Also, see Getting Vaccinated After You Are Exposed to Chickenpox. So, you can see what an endless process this has created, and as well in how many different situations they can actually recommend and give you a varicella vaccine; it is obviously endless. CHA CHING ...$$$$! And to think if you had just acquired chicken pox which millions of children survived with no adverse effect in childhood, THIS would ALL be OVER! Is the internded convenience, worth that? And how convenient is it if your child is vaccine harmed and with resulting permanent disability? Toxicity and vaccine risk is not an issue? The CDC still claims that in only one vaccine given out of one million, is there any risk of harmful vaccine reactions; and even then they say it could not be proven it was the vaccine. Are they for profit insane? Have they NEVER been to VAERS, nor reviewed the federal vaccine court payouts data, with well over 2 billion dollars since 1998? How many of those claims were turned away or never qualified due to existing time limit constraints. How many claims were never filed, but rightfully could have been had the parent realized and had been willing and with the finances, fortitude to file and wait years for the case to be heard? VAERS with its well known only 1 to 10% reporting factor, simply because doctors are to pharma brainwashed to even admit a vaccine related averse reaction and resulting unrecovered from outcome. Bankrupting the family (Gardasil for example), looking for anything but a connection to the vaccine/s. An how would you ever know which one it was when up 9 in one day are given to a child in a single visit? If you do not have immunity against chickenpox and are exposed to someone with this disease or shingles, talk with your doctor about getting chickenpox vaccine. You should get chickenpox vaccine within 3 to 5 days of being exposed. You need 2 doses of vaccine are two different times. For more information, see Who Needs Chickenpox Vaccine. If you previously got one dose of chickenpox vaccine, you should get a second dose. This proposes an entirely endless process of chasing the varicella virus, where a child could have acquired the illness and had life time immunity, within days. Although I would not personally do so, nor recommend it; they the individual as well if they choose to at age 60, then can choose if they want to, to acquire the shingles vaccine, due to the vaccination status of the younger generations. This is common sense. An endless and ever increasing number of vaccines now CDC recommended for as well adults, even pregnant women, and seniors. And THIS is going to give YOU good health??? Really??? And giving your infant and child 49 doses of 14 vaccines before the age of 6, with the biggest share given by the age of 2; will make them resistant to horrible and CDC fear mongered about diseases? And you are sure that this will not just create more chronic illness, disorders, and as well cancer? So, where do YOU think all the chronic disorders and illness in children is coming from today? Bad parenting? I bet it all due to genetic defects, and genes? Wouldn't Paul Offit want you to believe that, and doesn't he tell you to believe that, and to thus remain mislead that they as well, have all the so called science? They have nothing, as a fact. Get educated to the truth. Do the unbiased research! Quite obviously modern medicine and the vaccine issue is so full of deception and quackery, defying all rational common sense and honesty; that it certainly shows to be more profit and control of information crazy, than literally a monkey chasing its tail! No other entity on earth and originally promoted by the Rockefeller oil and rail profits, has ever been as able to with complete impunity, to sell dishonesty and full blown medical quackery to the public, the way this allopathic chemicalized medicine system has. [PDF] The polio vaccine: a critical assessment of its arcane history, efficacy, and long-term health-related consequences. As they say, the proof is in the pudding ! Well done Dr. Tent, now to get the world to come together and stop this madness. Excerpt: As a matter of fact, the American Public in general was so optimistic and HAPPY in 1921, that relatively few people were unhealthy as well. For the first time in decades, hospital beds were empty. The fledgling American Medical Association, formed by John D. Rockefeller just a few years earlier, was worried. Business was sagging. Profits from vaccines and drugs were spiraling. Something had to be done, and done immediately. False, faux epidemics of smallpox were created to solve the problem, and keep the Medical Mafia's cash registers ringing. 1920 Published by Chas M. Higgins, Brooklyn. PSC explains that Flublok is produced by extracting cells from a type of caterpillar. The cells are then genetically altered to produce large amounts of hemagglutinin, a flu virus protein that enables the flu virus itself to enter the body rapidly. The U.S. Food and Drug Administration (FDA) has also recently approved a new flu vaccine known as Flucelvax that is made using dog kidney cells. It is a product of pharmaceutical giant Novartis and like Flublok, Flucelvax was made funded by a $1 billion, taxpayer-funded grant given by the U.S. Department of Health and Human Services (HHS) to the vaccine industry back in 2006 to develop new vaccine manufacturing methods. Instead of to producing vaccines the "traditional" way using egg cultures, vaccine manufacturers now have the ability to quickly produce large batches of flu virus protein using GM Organisms (GMOs). This, in turn, will increase vaccine industry profits. There are reportedly two other GMO flu vaccines currently under development. According to Reuters, one being produced by Novavax, will utilize "bits of genetic material grown in caterpillar cells called 'virus-like particles' that mimic a flu virus." Vaccines, made from bugs and insects, unbelievable. Mans means to health, so saved the day, right? As well what is Gardasil made from; (insect cells). So, ask why has the CDC REFUSED to consider this information? Real physiological science, doesn't matter? Should not neuroscience be a part of the determination of vaccine risks, verses any benefit? Who are the REAL quacks; Dr Blaylock, or those at the CDC and pharma? Dr. Russell Blaylock is a board certified neurosurgeon, author and lecturer. He attended the Louisiana State University School of Medicine in New Orleans and completed his general surgical internship and neurosurgical residency at the Medical University of South Carolina in Charleston, South Carolina. During his residency training he worked with the eminent neurosurgeon, Dr. Ludwig Kempe. Together they developed the transcallosal removal of intraventricular tumors, a technique still used today. For the past 25 years he has practiced neurosurgery in addition to having a nutritional practice. He recently retired from his neurosurgical duties to devote his full attention to nutritional studies and neuroscience research. Neurosurgeon issues public challenge to vaccine zealots: Inject yourselves with all shots you say children should get! "49 doses of 14 vaccines, by the age of 6"